Welcome to Fitness Friday! In this series I share some of my favorite exercises that I’ve found to be truly effective and worth every precious gym minute. This week’s exercise was featured this past winter in Shape Magazine in an article about Kelly Osborne’s weight loss and fitness plan. I tried it for myself, liked it, and have been doing it on and off ever since. 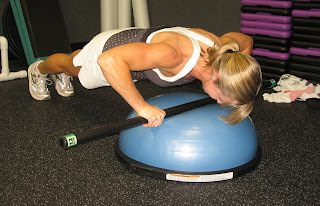 I like that it works my chest and core at the same time. 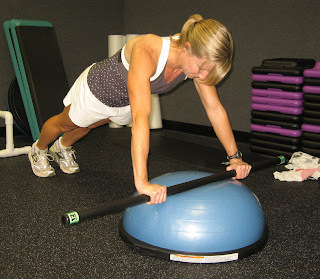 To perform this exercise you’ll need a Bosu Ball and a weighted bar. The weight of the bar doesn’t matter, choose a bar that feels comfortable for your grip. Do a slow push-up. Hold for a moment at the bottom of the movement. Three sets of ten repetitions is what I do for this exercise. 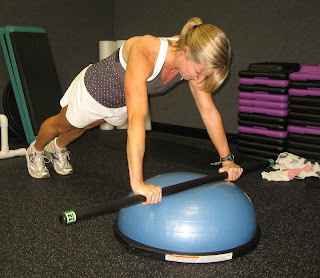 I love that my chest and core get a workout at the same time. More bang for the buck! A video is always helpful! 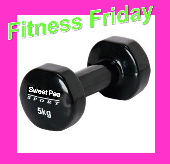 Do you keep up your exercise routine in the summer? I tend to slack off in the gym because I’d rather spend time outside. No summer slack off for me. I am one of those crazy morning people and am at the Y every week day morning at 5:30 am. Yeh, crazy I know! Oh my goodness, Paula! This looks like a tough one! Yikes! I know results would come with this exercise. I’m like Love Being a Nonny”. I’m at the gym most mornings by 5:30. Trying to get Mr. Brown Socks to take walks with me in the evening as I love being outdoors too. I’ve never tried this, but I can tell it would be a good one! It looks pretty challenging, which I love.